Two events reminded me recently that you can’t have too many choices for solving a sourcing problem. A client and I had finished a simple PCB design, got it off to OSH Park and OSH Stencils, and turned attention to the BOM. All passives but one: in my shop already, so check. The remaining one and some connectors: Digikey has them, so check mark. The central IC that is the point of the board: Digikey, zero. Mouser, zero. Other suppliers we’d heard of, zero. Anyplace in the USA, zero. China, only on breakouts. Ouch. Europe: “Rutronik”. Who? After a day of thrashing I noticed this is the chip manufacturer’s favorite distributor in Europe, and I should be able to trust them. I had to establish a business account but all was well until we got to shipping: Big ouch. And this huge minimum shipping wasn’t for Startrek teleportation beaming from their warehouse to my bench, as the fee implied. They predicted 72 hours, but later we found that was if you’re in the EU. Oh, right. When it wasn’t at my door in 72 hours I dug up an Excel spreadsheet via a well disguised link on my account page and on one row was a red “warning dot”. More digging and I decoded this warning to translate to English as ” six days estimated delivery from order date”. But the chips should be here in time for the reflow oven and all is well even if the client’s wallet is thinner than desired. Just days later another client and I were deciding what parts of a new board really needed breadboarding to give us confidence in a major respin and this forced an immediate order of a few piddly parts (note to self: as soon as the part is on the short list for a design, order three of them.) I was inhaling to commiserate about shipping when the client reminded me that Arrow isn’t charging anything for shipping. Period. Zero, no matter what size the order is. I was startled, as this has been going on for months and I just assumed it was a one shot, short time thing and had let it fade from my memory. Instead I was able to throw the part number and quantity for a special FET I want to try out into the client’s order, smiling at the idea and my share of the shipping will be zero. Nice. Meanwhile, the US rep for the big Euro distributor contacted me and we’ve agreed I will call her before risking another big wad on shipping that isn’t even fast in relation to the cost. So, one arrow moved to the front of the quiver and a new one added for Euro parts that the US hasn’t discovered or that got too popular for supply here to keep up with. Adam Haile and Dan Ternes of Maniacal Labs have been busy. By accident I came across their site on Tindie and see they have a new product. 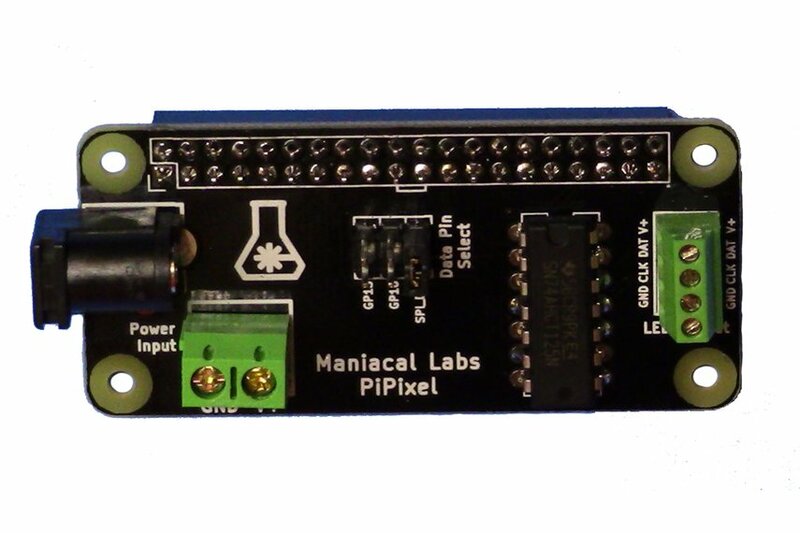 PiPixel is oriented toward Raspberry Pi enthusiasts who would like to work with smart RGB LED strips. It’s described in detail on their web site. This is a super low cost kit that would make an excellent beginning soldering project with a big payoff. Find all the details on the ‘Labs web site. Offering stainless steel as well as kapton (stainless steel are common 4mil thickness). 5x5mil smallest feature size possible with kapton stencils. Minimum feature size for steel stencils is ONE MIL! They see 70/30% split between 3mil and 5mil thickness of kapton. The 3mil is best for ordinary work, while the 5mil is appropriate for high power devices with large thermal pads, etc. where a lot of solder is needed. 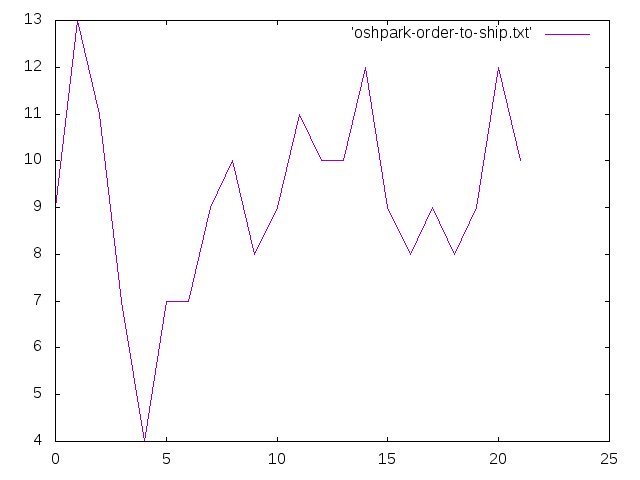 I can vouch for the fact that 5mil is a total disaster for fine pitch parts like a QFN package. Kapton in 4mil is unobtanium, which is why they don’t offer that thickness. Name is OSH Stencils because Brent was originally going to collaborate with Laen of OSH Park, but a change in Laen’s circumstances caused them to remain separate entities and Laen was totally OK with the similarity of names. Can reduce kapton stencil curl by “counter-rolling” the material and this will give temporary relief. Have maintained 24 hour turn time from the beginning. They went with high end laser to be able to make *the best* stainless steel stencils. They are competitive by avoiding framed stencils and using a proprietary material loading system into the LPKF. Basic cost of framed stencil material is 5X the cost of raw. 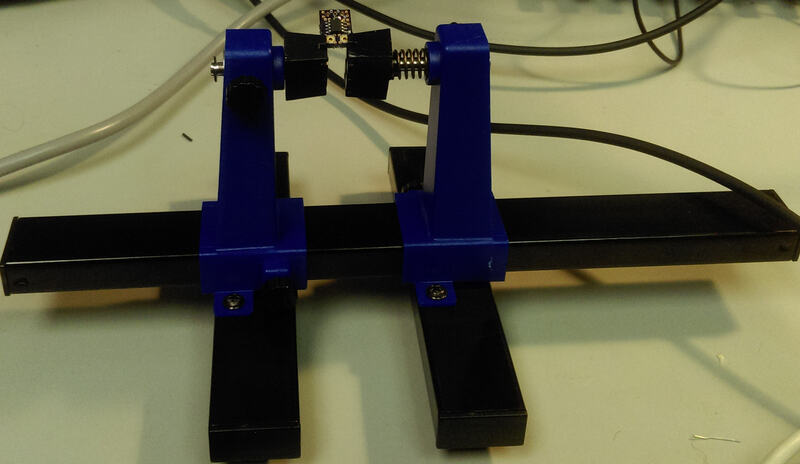 Could use “pneumatic frame” to simulate real frame, but that didn’t allow sheet sizes that were large enough to be cost effective. Brent said their charter as they began making steel stencils was to offer the top quality at reasonable prices. He invited people to compare their metal stencils to Chinese stencils under a microscope as they consider potential “cost savings” by going off shore. (OSH Stencils is in the Salt Lake City area of Utah). The metal makeup is different. Most offshore vendors use “inexpensive stainless steel”. Looking at the apertures (the cutouts) you often see grooves to do with the kerf (diameter of laser beam). With low quality metals the edges of apertures have grooves making them look like washboards. Also see minor warping and ripples in the Chinese metal. Look for “exciting announcements” to do with the stencil process to be offered by OSH Stencils in coming months. OSH Stencils makes stencils for customers that have nothing to do with electronics. Art projects, special “plates” for mechanical components, etc. They’re open to queries about whether your creative application can be handled by their equipment. 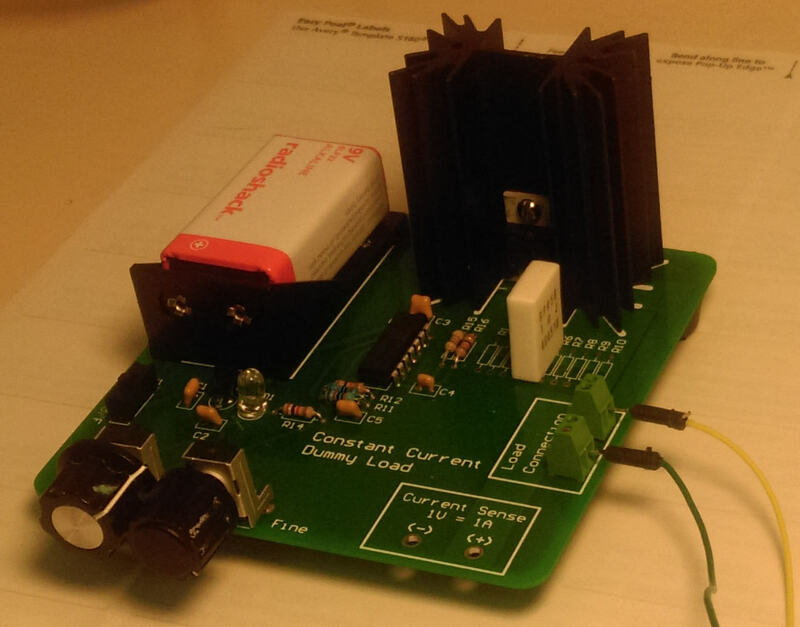 Folks familiar with the OSH Park web site for ordering PCBs may not be aware of their blog site with virtual tons of user project information. Enjoy! 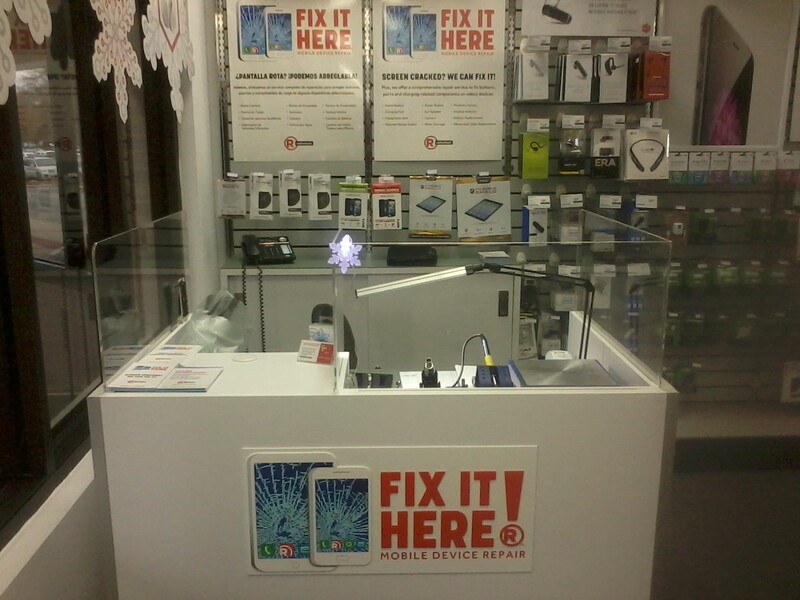 The Radioshack at Cary/Crossroads has set up a cellphone and tablet repair station in the corner of their store. It’s called “Fix It Here!”. My eyes nearly popped out at the site of state of the art SMT rework tools right there, with a very sharp guy named Matt who knows how to use them. He’s there and ready to fix your broken glass, failed connectors, etc. The phone number is 919 851 0332. And this particular Radioshack now has a wall full of Little Bits as well as a scrupulously maintained inventory of the other gadgets and gizmos embedded hobby enthusiasts need. I was encouraged that maybe they will adapt and pull out of their spiral.